Many people struggle get a halter or bridle on their horse if he lifts his head out of reach. Teach your horse to relax and lower his head with a simple touch. Give yourself several sessions to work on this goal. Remember that when you give your horse “the time it takes,” his confidence and trust in you will be stronger. 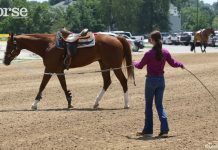 Working with your horse in-hand on a lead line, start with a good mane scratch to get him relaxed. Now put one hand at his poll and hold the lead rope in the other hand. Put a few ounces of pressure on his poll, asking him to drop his head. 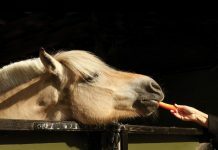 If he gives even slightly to the pressure, move your hand instantly back toward the withers along his mane, giving him a good rub as a reward. If he resists or raises his head, keep your hand at the poll with the same amount of pressure, but add pressure from below using the halter. Take a feel with the lead rope and ask again. Don’t pull your horse’s head down, but ask your horse to give to that feel. The moment you notice the slightest effort, release and reward. The more quickly you notice and release, the sooner your horse will understand what you want him to do. Start from the beginning each time: Apply a few ounces of pressure at the poll, add pressure from the halter until he gives, and release immediately. As your horse begins to understand, you can keep the poll pressure on to ask him to keep dropping his head. Again, don’t push his head down. Simply ask him to make a little more effort and reward often. Make this a routine for a month, and you’ll have your horse putting his nose wherever you want it. Sounds like something I need to do. Especially since my horse’s head is about 8 feet high off the ground when he holds it up. I can’t reach that! I am under 5′, horse is 15.2 w/ an extremely long neck. He is a Tennessee Walker, so he likes his head up. Generally when I ask he pulls it higher. I tack him up from a step because of his height. He bridles easily, takes the bit nicely, but is reluctant to give his head. I will try this tip- I have nudged he lead rope downward, but he doesn’t seem to get the message.